For his lifetime of dedication to the petroleum industry and for his vision and leadership, taking Saudi Aramco and the entire petroleum business to new levels of excellence, leading innovations in technology, business operations, and human resource investment. 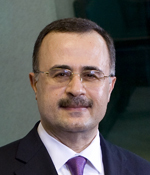 Amin H. Nasser is acting president and chief executive officer of Saudi Aramco and a member of its board of directors. He concurrently serves as senior vice president of upstream at Saudi Aramco. Nasser joined the company in 1982 and held various technical and operational assignments with the production engineering, drilling, and reservoir management departments. In 1997, he was named manager of the Ras Tanura producing department, and later, manager of the Northern Area producing engineering department, Safaniya Offshore producing department, and the Safaniya Onshore producing department, respectively. He was appointed chief petroleum engineer in 2004, and in 2005 was named executive director of petroleum engineering and development. Nasser’s distinguished leadership led to his appointment as vice president of petroleum engineering and development in 2006, and then as acting business-line head of Exploration and Producing (E&P) in 2007. In 2008, he became E&P's senior vice president. He has served on SPE’s Industry Advisory Council since 2008 and also served on the SPE International Board of Directors. He is cochair of the Saudi Aramco-King Fahd University of Petroleum and Minerals (KFUPM) Collaboration Oversight Board; the Saudi Aramco-King Abdullah University of Science & Technology Collaboration Oversight Board; and the Dhahran Techno-Valley Advisory Board. Nasser holds a BS in petroleum engineering from KFUPM.